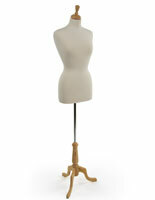 Wedding dress mannequins are essential to bridal retailers. To successfully sell a nuptial gown, you need the proper model. Hangers don’t let customers see the full dress and racks conceal the beautiful details and embellishments that brides are looking for – and can be the deciding factor in their gown. Wedding dress mannequins allow brides to see the shape and silhouette of the garment, making it easier to visualize themselves in it. 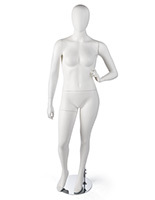 At Displays2go, we carry a variety of female wedding dress mannequins to fit any retail bridal shop. 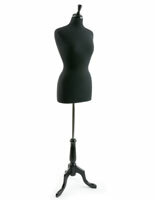 You can choose between abstract or realistic models, adjustable or fixed, and full body or torso pieces. Curious about what types of figurines we have to offer? Dress forms have a simpler design that emphasizes the gown. Brides will be able to observe the garment in detail. Some of our models are covered in fabrics that users can pin to tailor the dress for the bride, and are available in solid colors or floral prints. Life-like store figurines, however, are better for displaying gowns with accessories and giving soon-to-be brides a realistic portrayal of what they will look like. Decorate these figures with jewelry, veils, and shoes to show off a complete wedding day look. 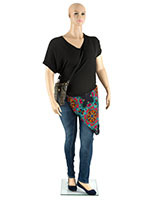 We have life-like female models with painted facial features in blonde or brunette wigs. Retail figurines put the spotlight on wedding garments, and are most effective when placed in a prominent location in your store. For the most visibility, these fixtures should be located at a central point in your shop or in a window display — an ideal location for showcasing bridal dresses. These presentations not only promote your gowns, but are a way to gain new traffic in your store. 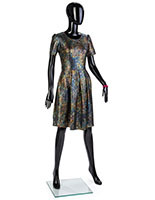 Potential customers could be window shopping, and then decide to come in your boutique to purchase something. Use this space to show the newest dresses you have in stock that brides won't be able to resist. Nuptial figurines are an important asset when selling gowns and brides will now have a better idea of what they want to see themselves in. Displays2go has a diverse selection of dress forms, and we are confident that any gown will stand out while being displayed. Shop online today for quick shipping and low prices!